Question: "I have been given a homemade DVD of a wedding and I just want to copy the DVD to another disc so that I can keep the original DVD in a safe place to prevent it from being damaged? Anyone has any idea on how to copy a homemade DVD to a blank DVD disc?" Answer: Get a DVD copy software that can copy homemade DVD and follow the instruction or wizard interface to backup your homemade DVD movies with ease. Homemade DVDs usually are not encrypted with any DVD copy protection. This makes it easy to backup homemade DVD movies with some freeware. 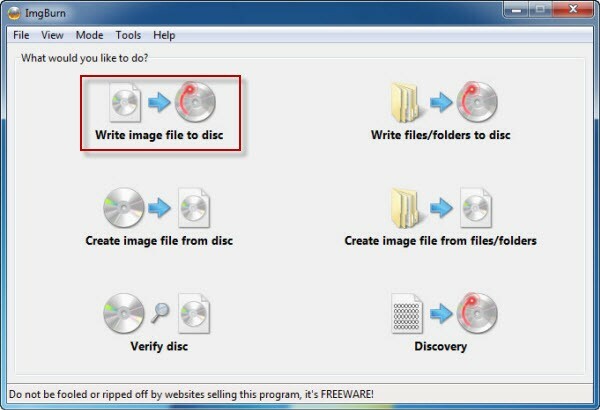 For DVD copying, the most well-known freeware may be DVD shrink. However, DVD shrink can only copy DVD to DVD folder and ISO image files instead of copying DVD to DVD disc directly. Here we will introduce how to backup homemade DVD to DVD using only one software - ImgBurn. ImgBurn cannot copy DVD to DVD directly, either. However, since it can both create image file from disc and write image file to disc, you can make a copy of homemade DVD for free in the following two steps. Insert the DVD disc you want to backup and on the main interface of ImgBurn, choose "Create image file from disc". Then on the pop up window, select the source file and destination folder, then hit the icon at the bottom to start coping homemade DVD movies to ISO image file. Now insert a blank DVD to your computer's hard drive, launch ImgBurn and choose "Write image file to disc". The a window will bring up, where you can select the source ISO file and check the burning settings, then just click the burning button at the bottom to start burning ISO to DVD disc. OK, now you've copied your homemade DVDs for free with ImgBurn. Just follow its wizard interface to do the copying easily and fast. By the way, if you don't want to copy the DVD by creating ISO image files first, then burning the ISO to DVD since this may result in loss of video quality, you can turn to some commercial DVD copy software, such as Aimersoft DVD Copy. It can help you copy both homemade DVDs and commercial DVDs to DVD–5, DVD–9, DVD-R, DVD+R, DVD-RW, DVD+RW, DVD+R DL, DVD-R DL and DVD-RAM. This will not work with Oprah. Nothing will. Thank you for posting this! Question-- will this work with an old (2004) TV show (episode of Oprah-- don't laugh) copied onto a DVD?? I need an extra DVD copy, but wondering about those copyright issues you mentioned.